Birthday Wishes for Fiancé: The best birthday wishes are those that come from the heart, and that’s exactly what you want to do when you wish your fiancé a Happy Birthday. From romantic quotes to sweet nothings, this is one greeting card in which you ought to pack in the mushy lines. After all, now you’re no longer just boyfriend-girlfriend. As his fiancée and wifey-to-be, let him know how much you love him and how lucky you feel to have him as your to-be-hubby. Oh, and make sure you share some of your cutest pictures on your Facebook and Instagram stories. Just another way to remind him how happy you are to be with him! Proposals, engagement and the unnerving anticipation of the wedding bells – this period of your lives is truly magical and so should be his birthday celebration. Smile, laugh, celebrate and embrace… these years will be the ones you fondly look back to. 1) Everyone has a weakness… mine happens to be you! Happy birthday! 2) When we get married, our wedding wows will be sealed on a piece of paper, but the promises we’ve made to each other have already been sealed in my heart. Happy birthday. 3) On the day you knelt on one knee and asked me to be your fiancée, you made me the happiest girl in the whole world. Not tell me birthday boy, what can I do to make you the happiest guy in the whole world? 4) I thought I had life all figured out, until you came along… when I realized that the most precious thing in the world can’t be touched, only felt with the heart. I love you, happy birthday! 5) I knew you were the one when all my dreams started meaning nothing if you weren’t in them. Happy birthday. 6) The best feeling in the world is knowing that no matter what I’ve been through, I have you to come back to. Happy birthday. 7) Ever since I was a little girl, all I wanted was to spend my life with a guy who would like me for who I am and not who he expected me to be. Thank you, for being just that person! Happy birthday sweetheart. 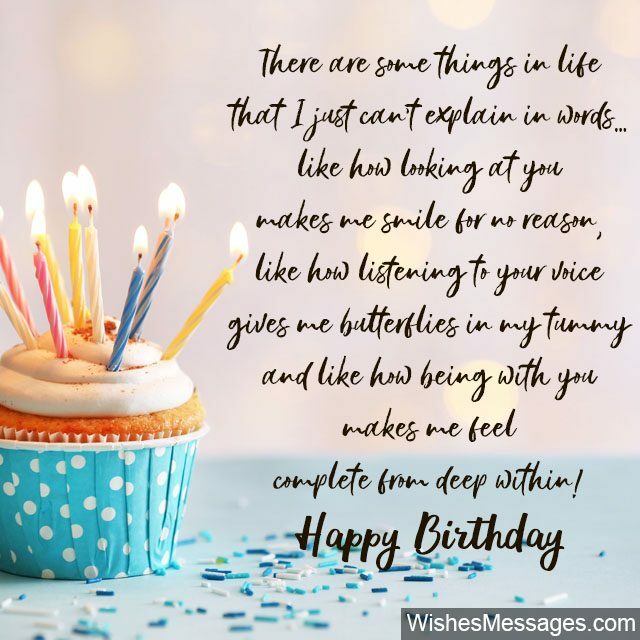 8) I knew you were the one, when being with you made me stop thinking about ‘finding the right person’ and focus on ‘being the right person’… I love you, happy birthday! 9) I used to have many ideas about how life should be… until the moment I realized that there’s nothing as precious as lying on green grass on a sunny day with you until the sun goes down. Happy birthday to my fiancé, my forever. 10) I knew we were made for each other, when I started falling in love again and again and again… with you! Happy birthday. 11) There are some feelings in life that I just can’t explain in words… like how looking at you makes me smile for no reason, like how listening to your voice gives me butterflies in my tummy and like how being with you makes me feel complete from deep within. I love you baby, happy birthday. 12) I’m grateful for all the bad things that’ve happened in my life… ‘coz they all taught me to recognize when the right thing came along – YOU! I love you babe. 13) This is your first birthday as my fiancé, so I’ll be able to kiss you when you cut your cake in front of all our friends and families… without feeling awkward! Happy birthday sweetheart. 15) Fiancé or not, ever since day one I’ve always loved you a lot. Happy birthday. 16) I will never forget the day we met for the first time… ‘coz that’s the moment I found my destiny. Happy birthday babe, I love you. 17) There are two things I never knew until I met you… one, that I could love someone THIS much and two, that someone’s love could make me THIS happy! Thank you, for being who you are in my life… not just my fiancé but my soul mate. Happy birthday. 18) The grand celebration of your birthday will continue for the rest of your life. Because you will soon be my husband and I, your wife. Happy birthday. 19) May we celebrate many more birthdays together, may we remain ‘one’ forever. Happy birthday. 20) A romantic birthday kiss for the most romantic man there ever was. A sweet birthday cake for the sweetest guy I’ve known. A cute greeting for the cutest hunk there is… and the best gift for the bestest fiancé there can ever be. Happy birthday. 21) From crush to fiancé, I knew you’d forever make me yours one day. Happy birthday. 22) My toast for your birthday is quite simple. I’m thankful for best gift I’ve received in my life so far… YOU!! Happy birthday. 23) A stunning pair we are, you and me. Arm in arm for the rest of our lives, we will be. Happy birthday. 24) Here’s a toast to us love birds… forever entangled in love’s blissful nest. Happy birthday. 25) I will remember this birthday forever because it is our first celebration as an officially engaged couple. I love you, happy birthday. 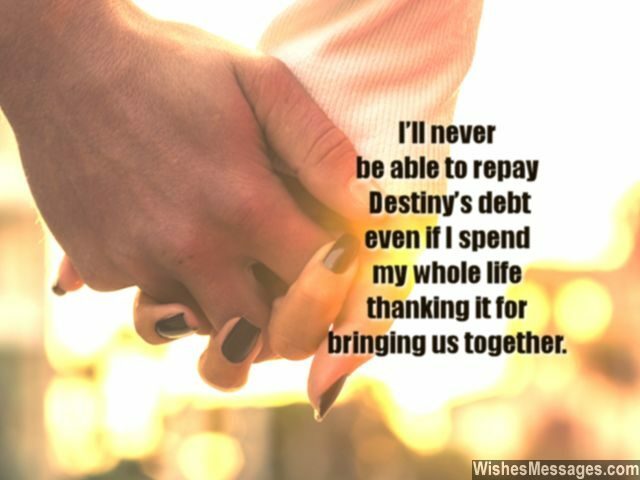 26) I’ll never be able to repay Destiny’s debt even if I spend my whole life thanking it for bringing us together. Happy birthday. 27) I will be upset if you have a birthday wish. After getting such a beautiful and beautiful fiancée like me, what more could you possibly ask for? 28) Until we get married and are officially allowed to forget each other’s birthdays, here’s wishing you a very happy one. I love you. 29) It was very hard, to pen down my thoughts. I didn’t know how to say, that I love you lots. But finally I got myself to, express how much I love you. Baby this is just a prelude of an eternal saga, of me showing how over you, I’ve gone gaga. Happy birthday. 30) As your fiancée, I have not only promised to marry you but also to celebrate each and every moment of your life – starting from this birthday. xoxo. 31) Our journey so far, has been an amazing ride. The best part is that you and me, have been side by side. Being together gives me, life’s best views. Even if I were born again, I’d hook up with no one but you. Happy birthday. 34) Happy birthday to the man who I am going to marry. Happy birthday to the man who will be the father of my kids. Happy birthday to the man who will be son-in-law to my parents. Happy birthday to… the only man in my life. 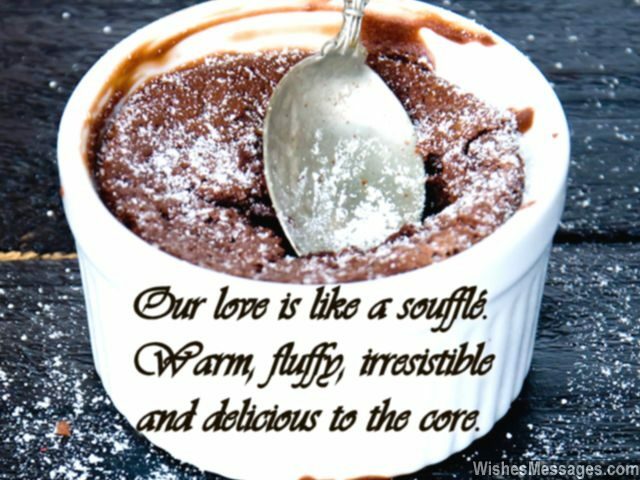 36) Our love is like a soufflé. Warm, fluffy, irresistible and delicious to the core. Happy birthday. 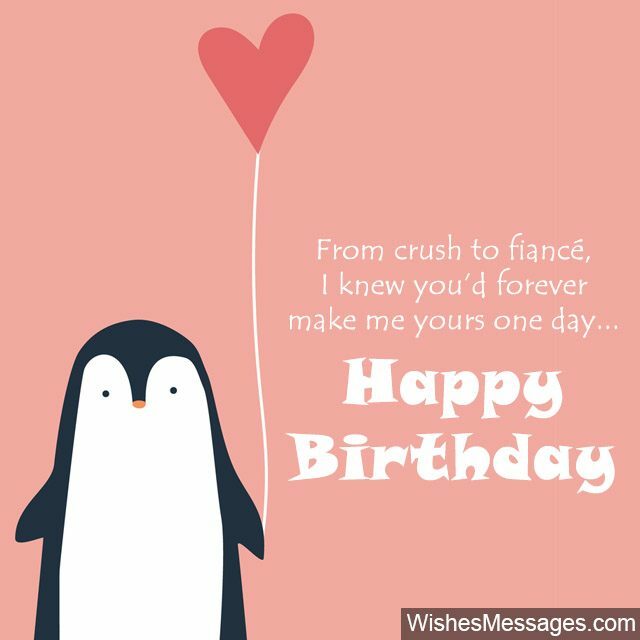 37) Wishing you a happy birthday for the first time as your fiancée, reminds me of the time when I wished you happy birthday for the first time as your girlfriend. Let’s make this one of the most romantic birthday celebrations ever. 38) Since we are both starting a brand new life together, technically this should your first birthday. So happy 1st birthday! 39) Happy birthday to the man who has promised to make my world go round for the rest of my life. Happy birthday. 40) The perfect gift, a cute greeting card, a party… nothing is enough to wish you a happy birthday! What you truly deserve is a lifetime of happiness, and that’s exactly what I’m going to give. Happy birthday.